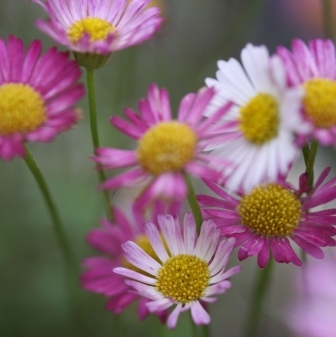 This little perennial Mexican daisy is a great addition to any country garden. It’s pretty in a pot or grows well at the foot of taller plants… just make sure it gets plenty of sun and well drained soil. The brilliant thing about this plant is that it self seeds and always seems to find just the right spot to settle in. You’ll often see it in cracks in paving, crevices at the base of a wall or alongside garden steps. The flowers open white then gradually turn pink. Here it’s growing with bearded Iris and a beautiful feathery grass called Stipa tenuissima which also self seeds freely.